I feel very grateful. In fact it is to the point that when I stop take in how grateful I feel my eyes begin to immediately moisten, my heart swells, and I seem to be at loss for words adequate enough to describe to any person the joy that fills my soul. Nothing in my life has compared to the last two years, the lessons I have learned and the experiences that I have had have shaped and molded me in unanticipated ways. I do not, and have not regretted it for a moment. I tried my best to cherish every moment, savor every friendship, learn from every mistake, roll with every setback, relish every change, and conquer every trial. I am by no means perfect, but I gave it all I had, and I don’t feel that I am leaving with any stones unturned. Granted there is much work still to do, but I have collected the necessary phone numbers, emails, and Facebook names to make sure that I can help to see it through. Some have called missionary work a sacrifice, but I never could seem to find out why. Unless you call giving up a few poor habits, a lot of idol thoughts, many childish quirks, and a couple of my favorite songs in exchange for self discipline, a relationship with God, countless eternal friendships, a love for the scriptures, and a deep respect for the eternal nature of families as a sacrifice. I know that my Heavenly Father loves me dearly, and I know that he loves every single person on this planet with the same incomprehensible love. Helping people see that love that their Heavenly Father has for them has enlarged my capacity to see people a little more like the way Heavenly Father sees them. It also has changed my perspective on the world. I found myself reading accounts of the suffering of the saints in Missouri and of the trials experienced by Alma and Amulek in Alma 14 yesterday for personal study. As I pondered on why I was guided to study those verses and what I could possible take as a lesson at this time in my life I had an ‘aha’ moment. The true blessings of discipleship will never be found, seen, or identified with natural eyes, it requires an eternal perspective to see the things of God. A question I often ask people is what has your faith in Jesus Christ afforded you in your life? The responses I received have varied in scope, but the have been the same in nature. All have focused on material blessings of the gospel. If you lost your wife and kids in a holocaust, were locked up in a prison and food, drink, and clothing were withheld from you, would you still feel blessed and highly favored of the Lord? As Elder Hamilton, a wise missionary companion of mine, once said, “God is less concerned with you temporal well being as he is with you spiritual well being.” The true blessings of the gospel of Jesus Christ are “love, joy, peace, long suffering, gentleness, goodness, faith, meekness, temperance” (Galatians 5:22) all of which are given in such eternal abundance that “there shall not be room enough to receive it.” (Malachi 3:10) These are among the blessings of the gospel I have received during the past two years, they are the blessings that we should strive for; they cannot be denied us regardless of the suffering that could possible be formed against us if we but remain faithful. These are the blessings that I imagine Alma and Amulek would list if they were asked the question. I know without a doubt in my mind that Jesus Christ is the son of God. That he felt and experienced every pain, temptation, and affliction that I have ever experienced. I know from personal experience that he is always there and is ready and willing to help if we let him. I know that the Book of Mormon is the word of God and that a “man will get nearer to God by abiding by its precepts than by any other book.” (Introduction to the Book of Mormon) I know that Joseph Smith is a prophet of God and that Thomas S. Monson is a prophet today. These things I know of myself and I will bear record of them to all who will but listen until the day I am called to return home. I say these things in the name of Jesus Christ. Amen. I love y’all and I will see you soon. P.S. Wittney (middle right) was baptized Saturday and it went very well. 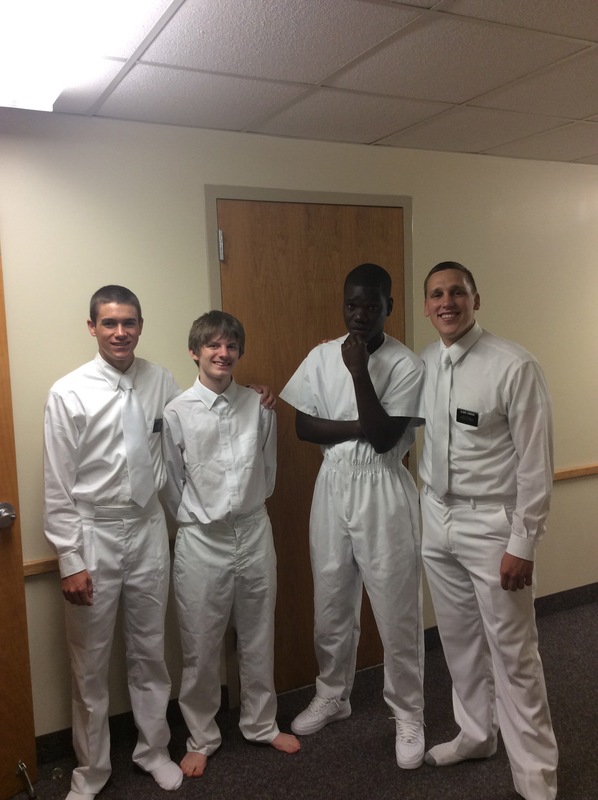 He was baptized by his friend Christian (middle left). Sunday I was able to confirm him. He looks good in a white shirt and tie, and his future looks even better.